In these works we address the problem of controlling a group of robots using only bearing measurements, e.g., the measurements that one could obtain directly from onboard cameras. 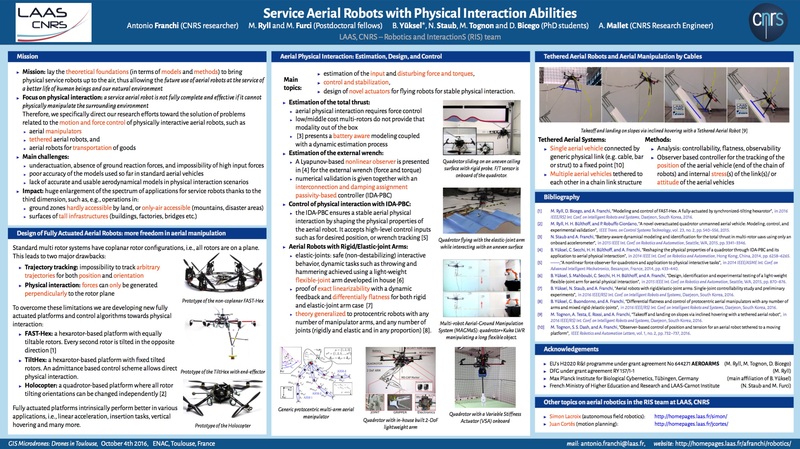 First we conduct a detailed theoretical analysis and then we present an extensive simulative and experimental work with multiple quadrotor UAVs. Consider the problem of localizing and encircling a target using a multi-robot system. This kind of task is interesting in view of the large number of potential applications, among which we mention observation (retrieve and merge data about an object from different viewpoints), escorting (protect a member of the system from unfriendly agents) and entrapment (prevent the motion of an alien object).